What are your favourite childhood memories of home? Nine-year-old Lily loved her new home - a cosy, one-bedroom unit that she shared with her mum Amy and little brother and sister, Aiden 7, and Emma 3. It had been a welcome refuge for the family after her mum had bravely escaped a domestic violence situation for the sake of her children. But just as they were getting back on their feet, it all fell apart. Their unit was being sold. With little money and no family support, Amy tried desperately to find a safe place to live, but she couldn’t find anything in her price range. 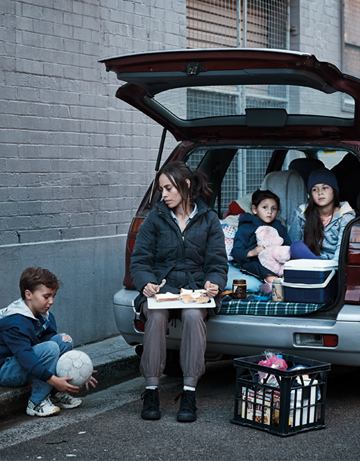 Within a week, Lily and her family were homeless with nowhere to go. Amy had no option, but to pack up her kids and their belongings and sleep in the family car. She found a quiet street near the park away from public view. She told the kids they were camping but they knew it wasn’t an adventure. They were squashed together in the backseat with all their bags. They were eating packet food and going to the park to wash and use the toilet. It was horrible. Every day, Amy continued to look for places to rent, but she couldn’t afford any of them. She had almost given up hope when a friend put her in touch with a Mission Australia case worker. Amy couldn’t believe it when she was told they’d found her family a home. Mission Australia was able to give Lily and her family the practical help they needed. Once we secured a home for the family, we were able to fill the house with furniture and help out with childcare fees so that Amy could go to TAFE to study. Because of the support of people like you, Amy and her kids are taking steps to move towards a life of independence. Your generous donation will be life-changing for vulnerable families like Lily’s. Will you help families like Lily’s to get back on their feet? *Names and images have been changed to protect the privacy of people we help.